This lesson provides an introduction to ensemble forecast systems using an operational case study of the Blizzard of 2013 in Southern Ontario. The module uses models available to forecasters in the Meteorological Service of Canada, including Canadian and U.S. global and regional ensembles. After briefly discussing the rationale for ensemble forecasting, the module presents small lessons on probabilistic ensemble products useful in winter weather forecasting, immediately followed by forecast applications to a southern Ontario case. The learner makes forecasts for the Ontario Storm Prediction Center area and, in the short range, for the Toronto metropolitan area. An additional section applies a probabilistic aviation product to forecasts for Toronto Pearson International Airport. Some of the questions could have been framed better. The overall module was too long in length and could have been broken into two separate modules. Too much information covered. Too many questions in the module (this does not include the quiz). Would be godd to be able to zoom certain plots or graphs as a user not used to details in the geography of the north America. Not bad, except VERY difficult to read some of the graphics. Need some sort of zoom feature. Useful module. ensembles are important in prediction. Describe the difference between deterministic forecasts produced by forecast models and probabilistic forecasts produced by ensemble forecast systems. Explain how different ensemble forecast products are developed. 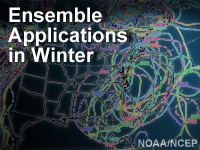 Explain how ensembles can be used to create winter weather and aviation products. Apply ensemble mean, spread, spaghetti, probability of exceedance diagrams, single station plume diagrams, and box and whisker diagrams (EPSgrams) to winter weather and aviation forecasts.